Untitled (2007) balances between figuration and abstraction. 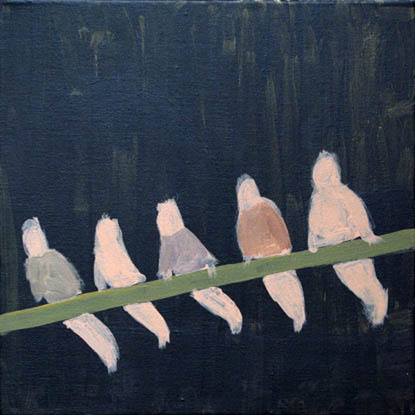 Five half bird, half human figures balance on an object against a dark void. The figures are devoid of characteristics, and the ambiguity of their body postures makes it unclear if they are aggressive, ready to attack or sitting passively. Eleni Bagaki's work focuses on artworks pulled directly from her imagination. Objects are recognisable or blurred into each other, within non-representational forms, mangled body parts, fire, teeth, and hairy perverted shapes emerge. Bagaki is fascinated with biomorphic, organic forms that sometimes take a symbolic meaning, or other times they simply imply human existence.